If you haven't already, create an account. Once you have an account, Log in using your email address and password you chose. Browse for the product you would like to purchase by clicking on the categories on the left hand side. 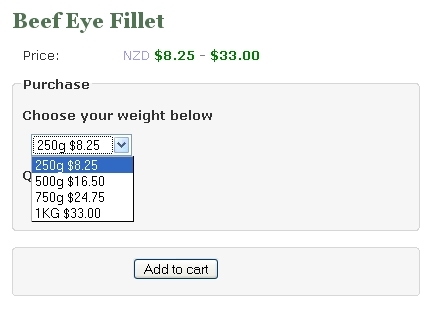 Click on the product you would like to purchase and then select what weight you would like from the drop down menu. You will be taken to your cart where you can update quantities, remove products, carry on shopping, or checkout. If you would like to checkout, click on the 'Checkout' button. Choose a shipping address and click on the 'Ship to my address' button, or create a new shipping address on the right. Confirm your order details and click on the 'Next: Payment' button. Click on the 'Pay through DPS' button. You will be taken to a secure payment page where you can enter in your credit card details to pay for your order. DPS is New Zealand's largest and most respected secure payment provider. Once you have completed your order, you will receive an email with your order details. Thank you for purchasing from Drury Meats!